BEIJING — The TV cameras are rolling, the bright lights are on and the reporters are readying their notebooks. It's the second day of the Chinese Communist Party's twice-a-decade congress held just off Tiananmen Square, and government organizers are preparing to kick off an early-morning event billed as a rare opportunity for selected journalists to speak with party cadres. The name of the event — "delegates corridor" — might evoke spontaneous hallway scenes on Capitol Hill in Washington, where American politicians walk through a gauntlet of eager reporters and dish out soundbites. The Communist Party, it turns out, has something much different in mind. An event producer with a walkie-talkie on her hip shuttles delegates, in groups of four, to a row of microphones where they introduce themselves. There's a square-jawed fighter pilot who flew missions off China's first aircraft carrier and a youthful engineer working on China's supercomputer. A passionate teacher touts China's primary school education and a farmer talks up worker protections laws. An author declares that President Xi Jinping's anticorruption campaign is unprecedented in the history of not just China — but all of humanity. When they're finished, a host solicits questions. He pauses for a moment, as if deciding which reporter to pick, then calls out a name — even though no one raises their hands. The reporters ask pre-arranged questions, and the delegates answer — only occasionally fumbling over their lines. 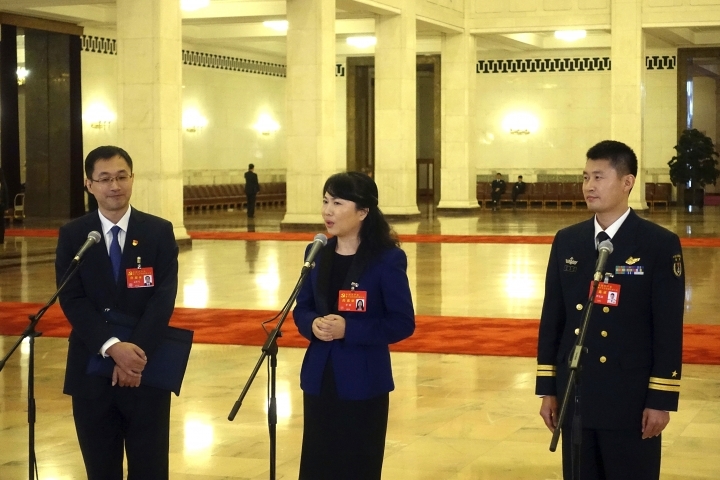 The "corridor" event, which was in fact held in the middle of a cavernous atrium in the Great Hall of the People, is a study in how the Communist Party is responding to pressure for greater transparency while maintaining an iron grip on what's said and how it's said. Long decrees continue to appear on the front of the People's Daily newspaper — but propaganda in 21st Century China is also rolled out with intricately set up, often heavily scripted news conferences that generate headlines and videos for state-controlled media. "The Communist Party knows how to play the PR game," said King-Wa Fu, associate professor at Hong Kong University's Journalism and Media Studies Center. "They know the nature of journalism. They need people to speak in front of the camera. Even if they are just speaking the party line, they need images and soundbites." 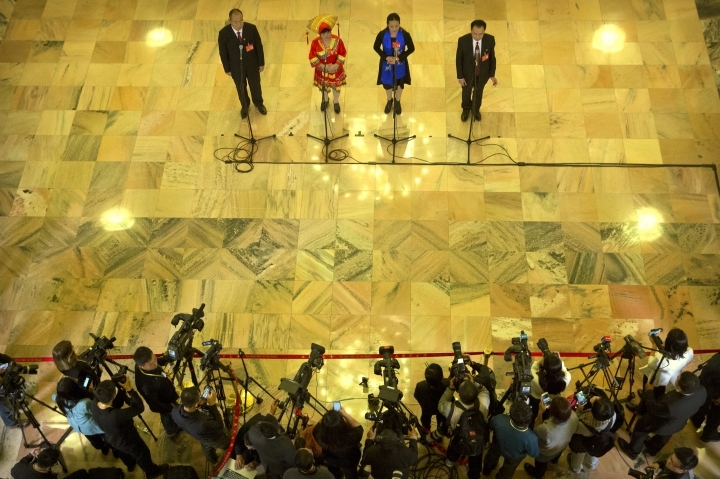 Although there are sometimes scrums at Chinese political events, the tightly scripted interview event format "helps frame the media angle into something they can control," Fu said. "It is much better than not organizing something like this, and letting the media pick up whatever they like." In recent decades, the Communist Party has held bigger, flashier political events to showcase to the outside world and its own citizens a political system meant to appear efficient, transparent and responsive to the masses. Meanwhile, the stagecraft has become more sophisticated at making the process look organic. Pre-screened questions at official news conferences are nothing new in China, but compared to several years ago, they're much more prevalent. 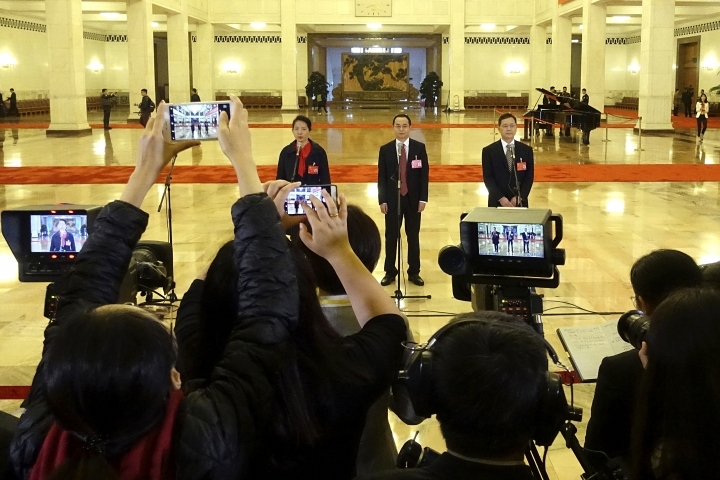 Reporters previously yelled questions at the end of meetings from their roped-off areas and would occasionally elicit a response — such as the time Jiang Zemin, the former party leader, famously walked over to tangle with reporters in 2000. These days, many meetings conclude with guards quickly ushering reporters out. 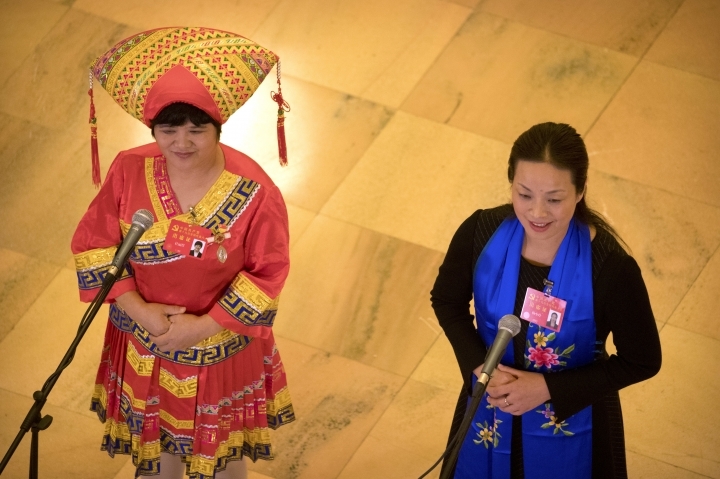 To give news conferences an open and international feel, hosts have been known to call on "foreign journalists" who turn out to be employees of Chinese state media. On Thursday, Akhil Parashar, an Indian reporter for the Chinese state-run China Radio International, was called upon to ask a question. His hand trembling, he took out a smartphone to read off a question in Chinese, asking a computer engineer whether China built the world's fastest computer just for the sake of building the world's fastest computer. No, the engineer responded, but with plenty of young talents like himself, China could guarantee scientific superiority well into the 21st century. "Thanks for your exciting answers, thank you!" the host said. "Our next group of delegates!" The coordination wasn't always perfect. In one instance, the host peered far into the back rafters and called on a reporter from a state newspaper — only to discover she was standing right behind him. She launched into her question anyway, and asked Xu Jun, a state book publisher, how he viewed his duties. "General-Secretary Xi has a brilliant summary of socialism with Chinese characteristics," he answered, referring to the president. The job of publishers, he said, was to offer fresh and precise interpretation of classic works to give Chinese people greater cultural self-confidence. After the event, Parashar, the Indian journalist, greeted a few well-wishers. So why did he get to ask a question? Was it because of his Chinese proficiency? His seniority at his agency? Parashar said he didn't know. "I think this was pre-decided," he said. "By my boss," he added. "Or my boss's boss." Associated Press reporter Yi-ling Liu in Hong Kong contributed to this report.